Want to live like a local when you visit Skopje? You’re in luck! 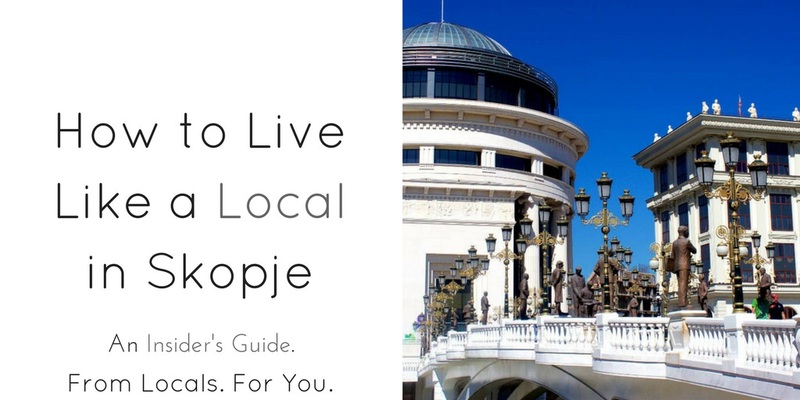 Below are tips I’ve collected (and tried) from the people who call Skopje home. Enjoy! 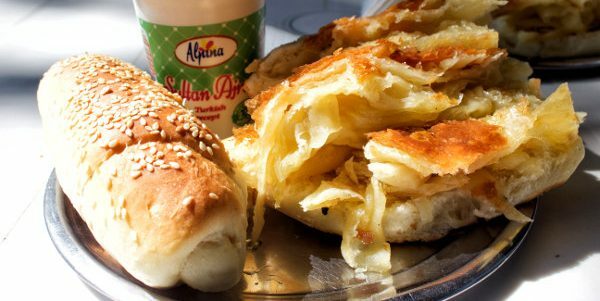 Burek and ayran from Furna Čair in Skopje, Macedonia. Eat fresh with a shopska salata. Consisting of locally-grown peppers, tomatoes, cucumbers, and onions covered in a feta-like white cheese, this salad is the perfect way to sample the fresh and flavorful vegetables for which Macedonian cuisine is so well known. Snack on some ajvar. Made primarily with red bell peppers, eggplant, and garlic, ajvar on crackers is a favorite snack of Skopje’s children—and many adults. Grab a bottle at a grocery store or make an appetizer of it at a restaurant. 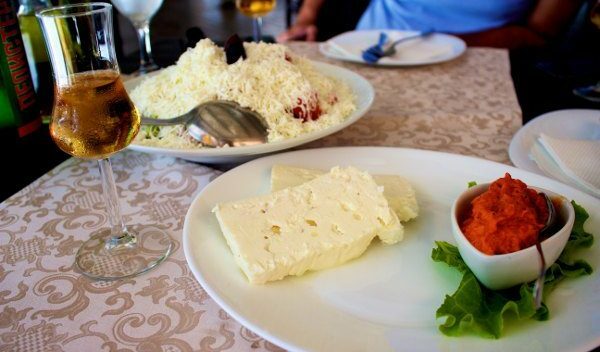 Rakija, shopska salata, local cheese, and ajvar from Restaurant Bonimi—the perfect start to a delicious meal in Skopje. Fill yourself up with tavce gravce. This baked-bean dish was traditionally eaten by Macedonia’s Orthodox Christian population as a meatless alternative on Fridays, but today you can have it any day of the week. Dine at a traditional Macedonian trattoria. No trip to Skopje would be complete without dining at a traditional Macedonian trattoria, where you can surround yourself with the sound of locals enjoy delicious regional specialities. Two names that came up time-and-time again were Restaurant Stara Kukja [Boulevard Phillip the Second of Macedon 14] and Makedonska Kukja [Teodosie Gologanov b.b, nearby Alumina]. Enjoy a homemade soda in the Old Bazaar. Near the northern entrance to the Old Bazaar, on Bitpazarska Street, is an unnamed storefront where you can grab a delicious homemade soda for just a few denari (literally pennies). Pick from blueberry, mixed berry or orange—flavorings which are made in house—and watch them whip up your drink in seconds. Homemade soda from the Old Bazaar in Skopje, Macedonia. Sip some rakija. In Macedonia, every worthwhile meal (save breakfast) starts with rakija, a type of fruit brandy that’s heavy on flavor and pairs perfectly with shokska salata. Look for Tikves Lozova Rakija—it’s the favorite brand of locals. 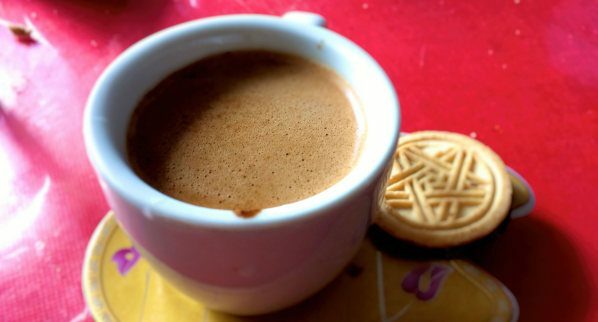 Have a Macedonian coffee in a kafeana. Macedonia has a well-developed coffee culture dating back to its time under the Ottoman Empire. In the Macedonia, the coffee, sugar, and water are all heated up together, giving the drink a unique flavor. Try one yourself at one of Skopje’s many kafeani, a type of local bistro. Enjoying a Macedonian coffee at a kafeana in Skopje, Macedonia. Order a Skopsko at Beerhouse AN. Brewed in Skopje since 1924, Skopsko is the most ubiquitous—and perhaps the best—Macedonian brew you will find. Order one at Beerhouse AN while exploring the city’s Old Bazaar [1472 Kapan An]. Check out Skopje 2014. Beginning in 2010, the Macedonian government began an ambitious—and expensive (with some estimates surpassing $700 million U.S. dollars)—re-imagination of central Skopje. The results have been controversial, to say the least. Complete with pirate ships, elegant neoclassical facades, light up fountains, rows of bronze statues, a series of patriotically-themed museums, palm trees, and piped-in music, the area resembles a cross between Las Vegas, Disneyland, and Washington, DC. When I was there, colorful graffiti still covered many of these items—the results of recent protests against alleged government corruption—making the scene even more surreal. Future plans call for a London-eye-like ferris wheel and more eclectic buildings, meaning Skopje 2014 will remain a must-see area. 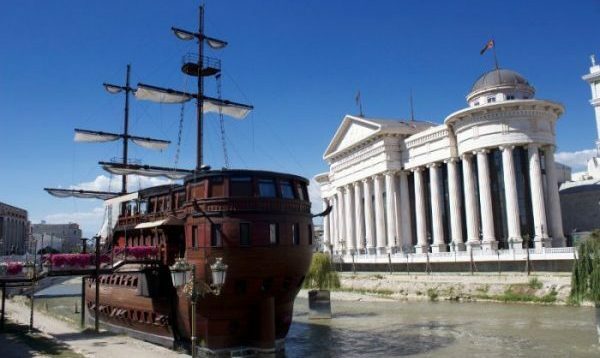 A pirate-ship-themed restaurant in Skopje, Macedonia. Wander through the Old Bazaar. Skopje’s Old Bazaar is a maze of canopied streets, narrow alleys, and storefronts at which Albanian- and Macedonian-speaking vendors sell food and crafts from throughout the Balkans. You can literally see, smell, and taste Skopje’s multi-ethnic heritage. 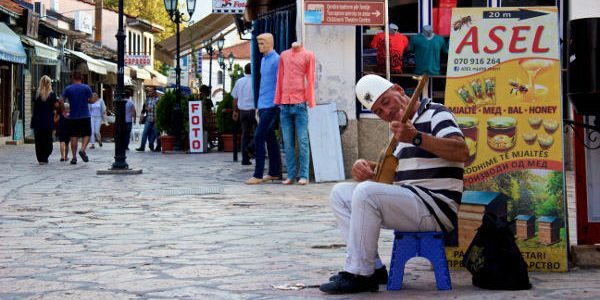 A musician plays a traditional Albanian instrument in the Old Bazaar of Skopje, Macedonia. Visit the Mustafa Pasha Mosque. A trip to Skopje wouldn’t be complete without experiencing the city’s Ottoman past. The Mustafa Pasha Mosque was built in 1492, when Skopje was ruled by Muslim overlords from the Ottoman Empire. A recent restoration of the building mean that one can again experience this historic site—with its intricate geometrical decor—as it was intended. Visit Matka Canyon. 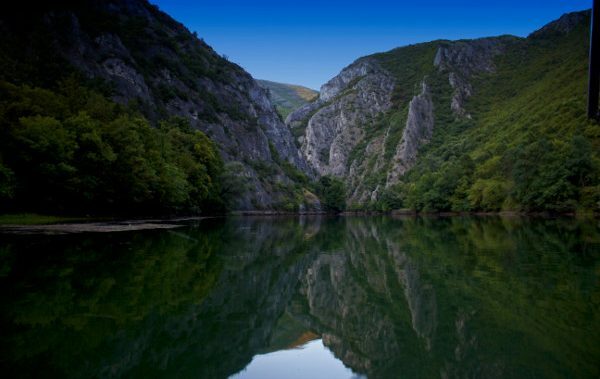 Located to the west of Skopje, Matka Canyon provides travelers with the opportunity to sample the serenity of the Macedonian countryside without traveling far. Hike the miles of mountainous trails, visit one of the several monasteries that cling to the rocky slopes, or take an hour-long boat ride around the Canyon (complete with a stop at an underwater cave). The easiest way to get there is to take a cab from the city center, but if you’re feeling adventurous, public buses will drop you off within walking distance of the entrance. To save a few denari, pack your own lunch as food at Matka can be pricey. Boating in Matka Canyon outside Skopje, Macedonia. Head to the top of Mount Vodno. Accessible via cable car or on foot, the peak of Mount Vodno provides a fantastic view of Skopje and the surrounding countryside. It also is the site of the Millennium Cross, a 200+ foot tall memorial to 2,000 years of Christianity. View from the top of Mount Vodno in Skopje, Macedonia. Take a pilgrimage to the Monastery of St. Panteleimon. On the side of Mount Vodno, near the village of Gorno Nerezi, is the Monastery of St. Panteleimon—home of some of the most important frescoes of the 12th century. As you enter, walk towards the scene of the Lamentation of Christ on the left wall. Note the agony on Mary’s face as she clings to the body of her dead son. Such clear expressions of emotion were rare in Western art at the time, and would only become widespread during the Italian Renaissance nearly two hundred years later. Thanks to a recently added shuttle bus from the central station to Gorno Nerezi [ask at the station for an up-to-date timetable], visiting the church has never been easier. Lamentation of Christ in the church of St. Panteleimon in Gorzno Nerezi, Macedonia. Dance the night away in Gradski Park. During the summer, this centrally-located park becomes the hub of nightlife in Skopje. Students and young adults flock to the series of outdoor bars and clubs that call the area home. While much has been said about the economic problems these groups face, it’s encouraging to see them continue to enjoy life. These clubs are open very late, so pick one with music you like and get your grove on until the sun rises.